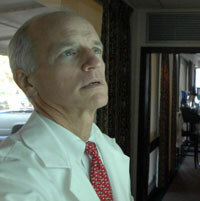 Dr. Roy Baker is the senior neurosurgeon in the group, having practiced in Savannah since July of 1983. After having been engaged in a busy surgical career over the past 35 years, his practice is now limited to office neurosurgery. Dr. Baker is actively involved in seeing adult patients for neurosurgical consultation in the outpatient office in Savannah on a daily basis. His special interests include evaluation and treatment of traumatic and degenerative problems of the spine, as well as intracranial injuries and tumors. Dr. Baker is an Alabama native, who graduated from medical school at University of Alabama in Birmingham, did his neurosurgical training at Washington University in St. Louis, and has been in practice here in Savannah since that time. He has been board certified since 1985, and has been an active member of the major national neurosurgical associations. Dr. Baker has been especially active in the Southern Neurosurgical Society through the years, and served as its president several years ago. He is married and has three grown children, four grandchildren, and is a former pilot.